Osteoarthritis, what is it? What are the signs and symptoms? What are the differences between Rheumatoid Arthritis and Osteoarthritis?Osteoarthritis is a degenerative joint disease characterised by the breakdown of the joint’s cartilage (this is the cushion between the bony surfaces) where the bones rub against each other, causing pain and loss of movement. Osteoarthritis is often called “wear-and-tear”. The biological causes of the disorder are not known. It does not appear to be caused by ageing itself, however osteoarthritis generally comes with ageing. In many cases, certain conditions seem to trigger osteoarthritis. People with joint injuries from sports, work-related activity or accidents may be at an increased risk. Severe obesity may lead to osteoarthritis of the knees. Individuals with mismatched surfaces on the joints could be damaged over time by abnormal stress may be prone to osteoarthritis. One study reported that wearing shoes with 2.5 in (6.3 cm) heels or higher may also be a contributing factor. High heels force women to alter the way they normally maintain balance, putting strain on the areas between the kneecap and thigh bone and on the inside of the knee joint. Although up to 85% of people over 65 show evidence of osteoarthritis on x-ray, only 35-50% experience symptoms. Symptoms range from very mild to very severe, affecting hands and weight-bearing joints such as knees, hips, feet and the back. The pain of osteoarthritis usually begins gradually and progresses slowly over many years. Osteoarthritis is commonly identified by aching pain in one or more joints, stiffness and loss of mobility. The disease can cause significant trouble when walking and whilst climbing stairs. Inflammation may or may not be present. Extensive use of the joint often exacerbates pain. 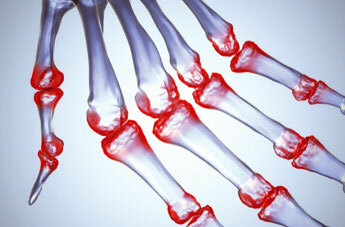 Osteoarthritis is often worse at night than in the morning and in humid weather than dry weather. Periods of inactivity, such as sleeping or sitting, may cause stiffness that can be eased by stretching and exercise. Bony lumps on the end joint of the finger (Herberden’s nodes) and on the middle joint of the finger (Bouchard’s nodes) may also develop. A diagnosis of osteoarthritis is made based on a physical exam and history of symptoms. X-rays are used to confirm diagnosis. An indication of cartilage loss is if the normal space between the bones in a joint is narrowed, if there is an abnormal increase in bone density or if bony projections or erosions are evident. Additional tests can be performed if other conditions are suspected eg blood tests will rule out rheumatoid arthritis. Rheumatoid arthritis (RA) is not a condition of wear and tear. It is an auto-immune disease which is when your own immune system mistakenly attacks healthy tissue, causing inflammation that damages your joints. Osteoarthritis (OA) is not an auto-immune disease. It is a condition of wear and tear associated with aging or injury. The immune system is not affected. RA usually causes pain or stiffness lasting for more than 30 minutes in the morning or after a long rest and lack of activity. OA stiffness tends to get worse with use throughout the day. RA can occur at any age. It often begins in middle age and tends to get worse over time. OA usually occurs as individuals age and in those whose joints have become worn down by excessive use. RA is associated with symmetrical swelling (eg both hands, both elbows) OA is associated with asymmetrical swelling in individual joints eg one knee and an elbow, instead of both knees. Most typically, RA symptoms include joint pain, swelling, tenderness and redness of the joints; prolonged morning stiffness; less range of movement. Some people also experience fever, weight loss, fatigue, and/or anaemia. Generally, OA symptoms include joint stiffness, pain and enlarged joints. With RA, inflammation generally occurs in the knuckles and at the joints closest to your hands, nearer the base of your fingers. Inflammation generally occurs at the joint closest to your fingernail. RA tends to cause swelling and pain in smaller joints such as the hands and ankles. OA tends to cause pain and swelling in bigger joints such as the hips and knees. Although Osteoarthritis and Rheumatoid arthritis have different causes the nutritional support used for both conditions is similar. Fish Oils (Omega 3) may help to reduce inflammation (especially in rheumatoid arthritis). Cold water fish such as salmon, trout, mackerel and tuna contain the most potent forms of omega 3 eicosapentaenoic acid (EPA) and docosahexanoic acid (DHA). Cod liver oil is a source of omega 3; however it also contains vitamin A and should be avoided by pregnant women.When looking for a supplement it is important to have a high EPA and DHA (eg Lambert’s Fish oils contain 310mg of EPA and 210mg of DHA). Glucosamine sulphate is naturally manufactured in the body and helps to build cartilage. It is useful to take for 3 months if there is a cartilage injury or take fulltime if a diagnosis of Osteoarthritis has been made. According to some reports, a daily dose of 750–1,500 mg of glucosamine may result in reduced joint pain, stiffness and swelling. Turmeric and Bromelain are also both useful with acute injury and inflammation. It has been reported that deficiencies in vitamin D in older people may worsen their condition, so individuals with osteoarthritis should strive to get the recommended 400 IU a day. To protect bones, adults should also consume at least 1,000 mg of calcium daily. Antioxidants such as vitamins C, E and Zinc are used to protect cells in the joints from damage. Exercise is important as it maintains joint flexibility and improves muscle strength. Regular weight-bearing exercise helps to protect the joints, by strengthening the supporting muscles, tendons, and ligaments. Joint protection, which prevents strain and stress on painful joints. Heat/cold therapy for temporary pain relief. Weight control is important as it prevents extra stress on weight-bearing joints. Surgery may be needed to relieve chronic pain in damaged joints. Osteoarthritis is the most common indication for total joint replacement of the hip and knee. Various pain control medications, including corticosteroids and NSAIDs (non-steroidal anti-inflammatory drugs such as aspirin, ibuprofen, and diclofenac) may be used. For inflamed joints that are not responsive to NSAIDS, injectable glucocorticoids may be used. Osteoarthritis is not life threatening, but quality of life can deteriorate significantly due to the pain and loss of mobility that it causes.